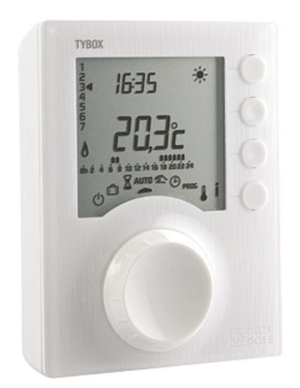 ... interfaces or exploiting the detectors of the anti-intrusion system supervised by the Touch Screen or the Web Server, this thermostat is able to detect the presence of any opened doors or thus avoiding energy waste. Total remote comfort control Wi-Fi capability makes it easy to adjust your home’s temperature and control energy costs from anywhere, using a smartphone, tablet or laptop. Combination Digital Thermostat and Energy Management The DDC merges digital temperature control with PIR occupancy sensing, and HVAC setback strategies to create the latest energy management technology in the industry today. A thermostat is a temperature-control component which turns power on or off when the system goes above or below the set temperature. It uses electronic or mechanical sensors to control the heating device, either electrically or mechanically. On ArchiExpo, these devices are categorized by properties such as function or type (e.g., mechanical, programmable). This device is commonly used to control and program central heating and air conditioning systems, radiators, showers and ovens. It may include a movement detector or other features. The time at which heating or cooling units come on or go off can be preset on a programmable model. For example, a home heating system may be programmed to turn off during the hours when no one is present in order to save energy. Some such models have a digital interface. Verify that the thermostat is compatible with the system it will control. Electric air conditioning, heat pumps, multistage and other types may require different devices. Choose a built-in or wall model and check applicable regulations. Determine whether the various areas of the structure will be heated uniformly or differentially. Control by zone can save energy in the latter case. If the space is to be heated uniformly, ensure that the thermostat is exposed to the general airflow and not in direct sunlight or too close to heat sources that will distort the readings.